What is your background in construction? I have been in the industry for years and have had experience in almost every aspect of building a home. I worked as a laborer, as a framing contractor, as an excavator, and even owned and operated a title company. I have also developed several neighborhoods in the Salt Lake Valley and surrounding areas. What are the scope of your services? We not only build custom homes, but we also offer design services to our clients. We are with them every step of the way to suggest selection on each detail of their home and ensure that they are getting the highest quality for the best value. What geographic regions do you serve? We proudly serve the Salt Lake Valley, as well as the Park City Area, Wasatch County, and the Utah Valley. What other in-house services do you offer? We have incredibly skilled painters in-house, as well as in-house specialty labor. Our team could truthfully build a home from the ground up, but we’ll leave that to our amazing subcontractors. Could you tell us a bit about your process? We work with clients on an as-needed basis, meaning that if a client needs a lot-house plans, an interior designer, etc.-we will consult and help them with each aspect that they need. If a client already has a lot in place, or already has house plans, then we help them with what they are still missing, and advise them on what they’ve already selected. Each member of our team works closely with our clients, and we keep our books open too, so our clients know exactly how much their home is costing them at all times. I have been working on several big projects lately. One project in particular that I’m really excited about is the Nirvana project. Eight new single-family homes will be constructed in the heart of Old Town, Park City. Are there any projects you are particularly proud of? I am proud of each home we create with our clients, and I continually push boundaries to create even bigger, better homes. A few notables include a 22,000-square-foot home modeled after the palace of Versailles and featured in the Salt Lake Parade of Homes a few years ago, as well as a beautiful rambler situated in the Glenwild Golf community, part of the Park City Showcase of Homes a couple years ago. What’s the difference between a good and a great home? I can always tell the difference between a good home and a great home- it’s in the details. The best part of my work is at the end of a project- the letters of thanks and appreciation from our clients. I keep all of these letters in a book on my table- and it’s one of my most prized possessions. When I was 14 years old, my Boy Scout leader secured me a job with a large home builder. I was a clean-up laborer and worked my way up. Eventually, I became an estimator and then a project manager. From there I was able to expand in the business even more and gain experience in many other areas of the field. I can’t imagine doing anything but construction! Fall is definitely my favorite season. There’s anticipation as the holiday season approaches, which is the best time of year, and of course hunting season starts! Best trip you have ever taken? The best trip I have ever gone on was when I went to Maui with my family. Being there all together with the kids and grand kids, and taking in the beautiful scenery was a dream come true! 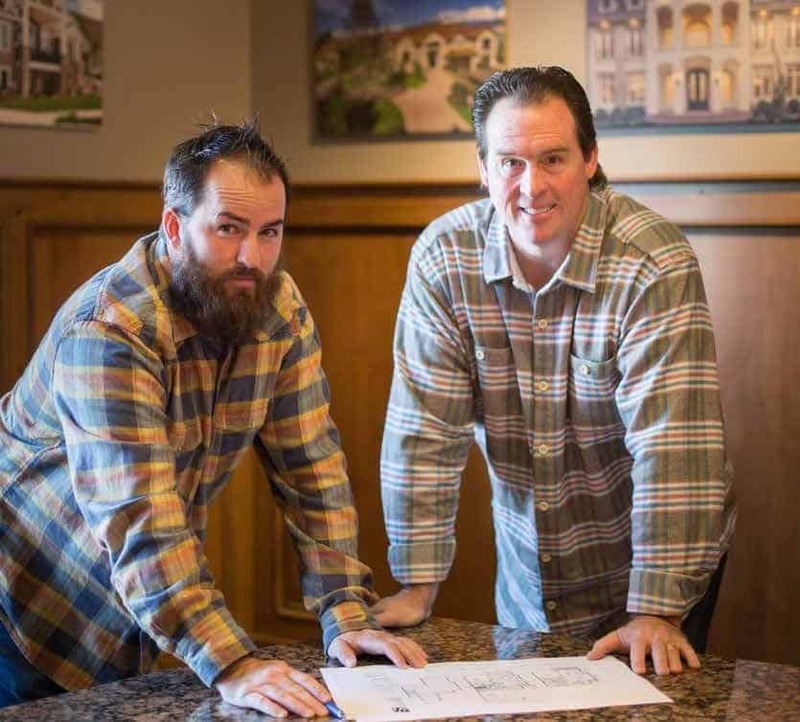 At Lane Myers Construction we have earned our position as a reputable, respected Utah home builder. Lane has spent over 30 years increasing his knowledge and developing a sharp eye for detail. This has allowed him to cultivate a roster of subcontractors that share our vision and know how to execute it masterfully. We recognize and appreciate quality workmanship, and continually strive for uncompromising, high-quality homes. We have built over 50 homes for peers in the industry. We have had the privilege of building multiple custom homes for various clients. In some cases, this spans generations. Each home we build is important to us. By working side by side with our clients and learning what’s important to them, we are able to turn their vision into a reality. At Lane Myers Construction, three core values guide us- quality, integrity, and teamwork. As a small company, we are able to closely work with each home owner to go above and beyond their expectations. A portion of our clients are out-of-state during the building process. Our office team ensures you are always up-to-date on the building process, keeping you informed through photos, videos, drawings, and documents. Additionally, we keep our books open for full disclosure. With Lane’s experience and the rich expertise surrounding him, our company enjoys the design process, and collaboration with architects and interior designers. Together as an experienced team, we are confident that we can make your dream home, become a reality.